Looking for a healthier potato salad? No mayo required here. 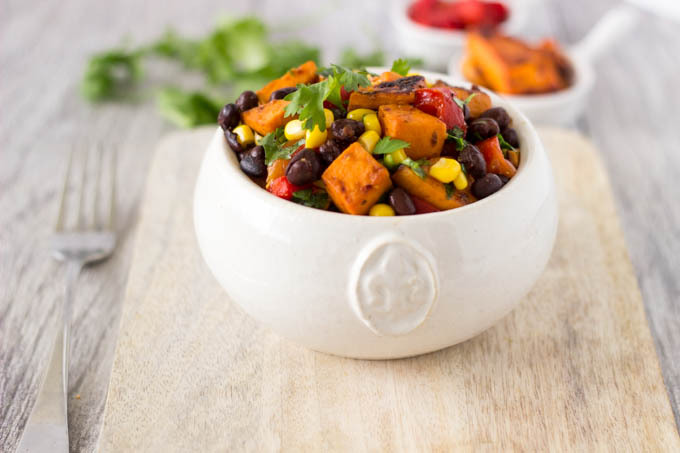 Spice up your back yard BBQ, with this smokey chipotle mix of sweet potatoes, black beans, corn, roasted red peppers and cilantro. Can be served chilled, room temperature, or even hot. 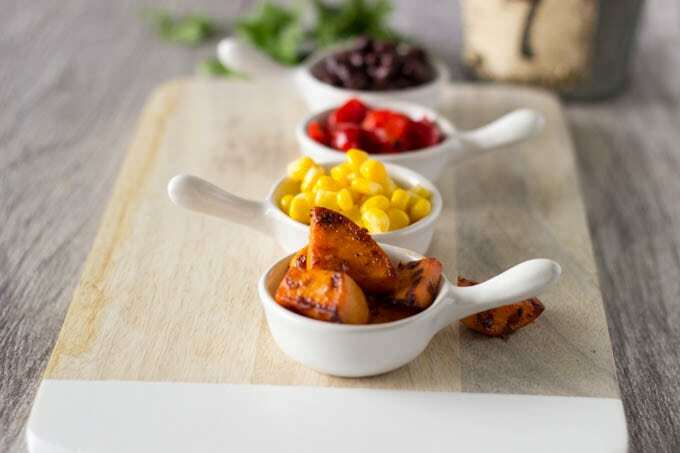 A perfect complement to so many of your summertime BBQ favorites. 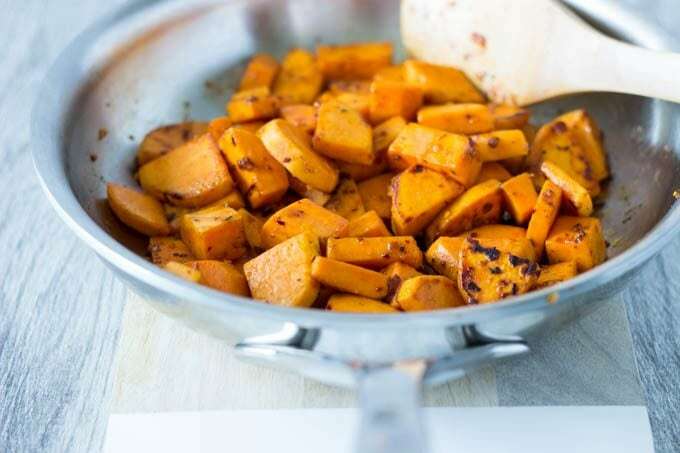 Coat the sweet potatoes with olive oil and spices and cook over medium heat until just turning brown. Add brown sugar for the final few minutes of cooking to give the potatoes their sweet, smokey, spicy flavor. Add the black beans, corn, roasted red peppers and chopped cilantro. This salad can be served chilled, room temperature, or even hot. 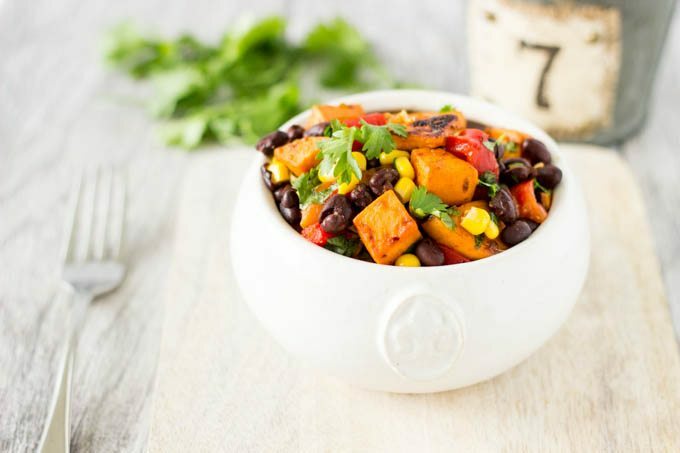 The chipotle flavor of this salad make it a great compliment to any of your BBQ favorites. It’s also a great stand alone light meal option. Get creative…I’ve even had it on top of a piece of toasted artisan bread as an open face sandwich (yum yum!). Heat a large frying pan or cast iron skillet over medium heat. Add potato mixture and cook stirring frequently. When potatoes just start to brown,(approx. 15 min.) add brown sugar (adding earlier will cause the potatoes to burn quickly) . Cook until golden brown and tender . Set aside to cool. 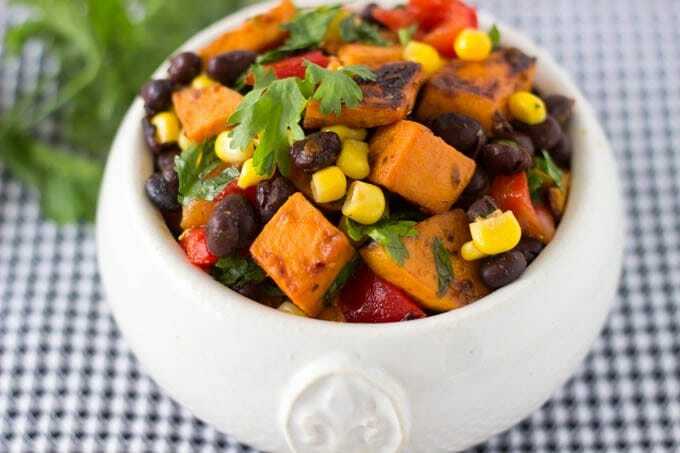 In a large bowl combine corn, black beans, cilantro and cooled sweet potatoes. Mix thoroughly, you may wish to add a drizzle of olive oil if necessary. Salad can be served room temperature, chilled or hot. Garnish with additional cilantro or a little dollop of sour cream. I made this today and it was awesome! I love a kick so I added some diced pickled jalapeño as well. 🙂 Thanks for the great recipe! great idea Danielle!…yum! I bet pickled jalapeno was a nice addition. Your recipes look fantastic and fairly easy to make! Thank you so much for sharing! I will try a few of these this weekend! Hi Benda…thanks! Hope you enjoy! Susan, Love this dish. 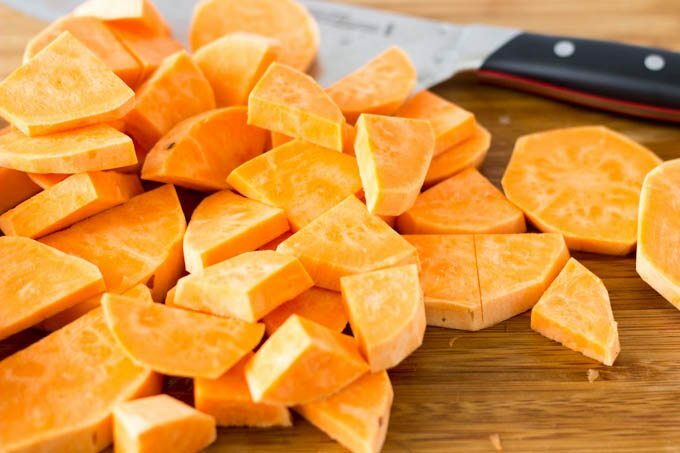 Making healthy sweet potatoes into a “potato salad” how clever is that! Giving it a southwest kick really gives a new meaning to south by southwest.